On this page, I'm going to comment trips and experiences I make with the caravan or changes and updates I make to it. The main focus will be on the technical part. The page will be in english only. The goal this time was to make a longer tour – ideally 1-2 weeks. But unfortunately the weather was bad ... Of course, you can go out cycling when it's raining (and you are certainly better in a caravan than in a tent), but personally I think that this is not really a pleasure. I mean: one or two days of rain are ok, but this time they announced rain the whole week without interruption. So I ended up travelling during 5 days only in which I made 279 km. 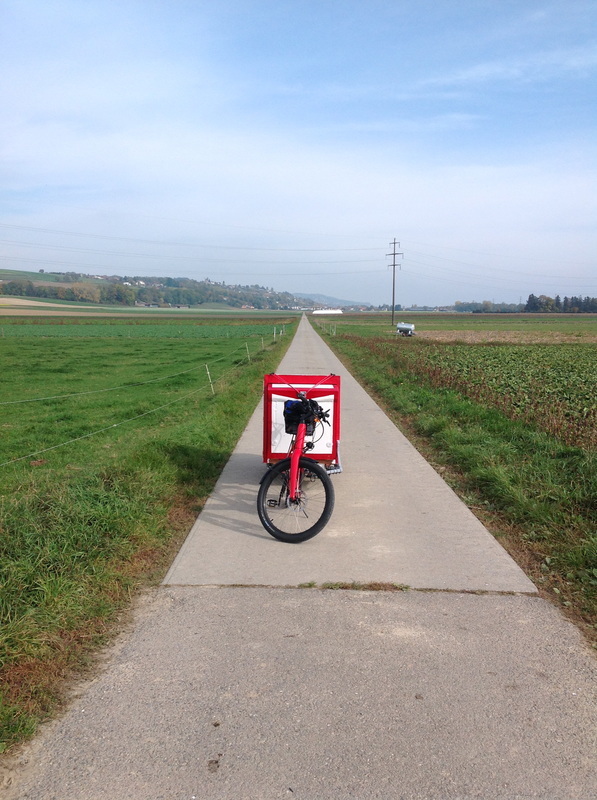 And again: I managed to make the whole tour without external charging of the e-bike, so only solar power was used! 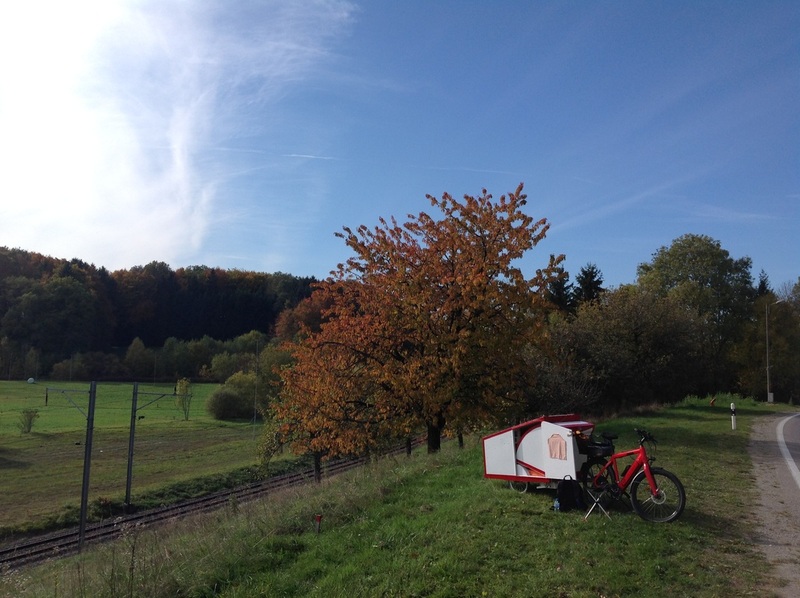 (1) From Wohlen to Salvisberg (about 80m): extremely steep climbing (18%). I switched to „power mode“ and tried to overcome it pedaling as much as I could, but no chance: the motor overheated in less than 3 minutes (20 minutes to let it cool down again ...)! 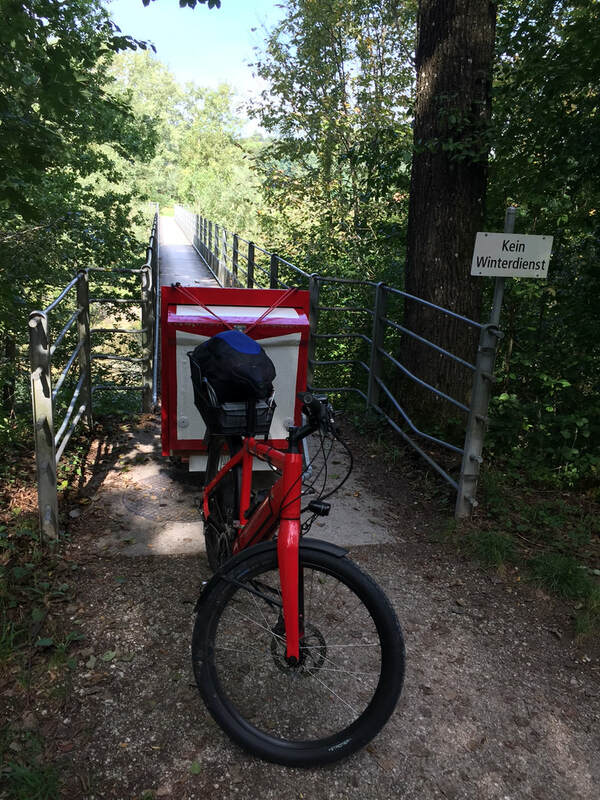 Conclusion: there is only one solution for such climbings – push your bike (and caravan ...)! 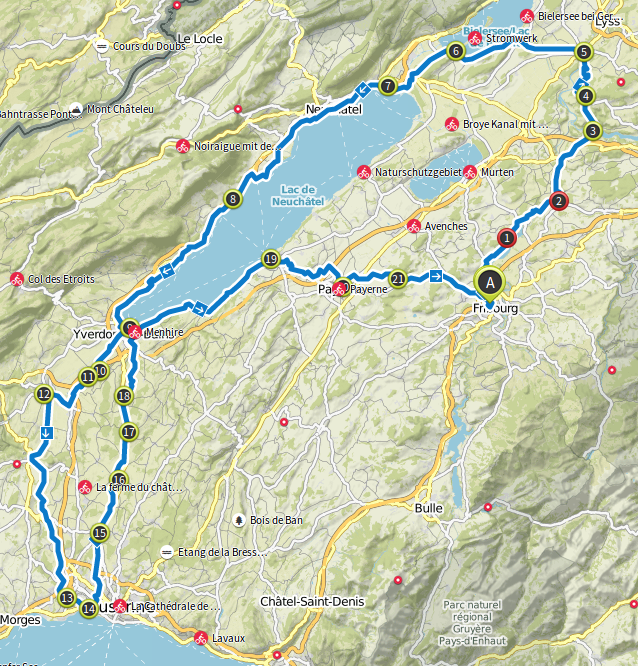 (2) From Lausanne (350 meters) to Cheseaux (about 620 meters): rather steep at the beginning (but less then the first example), but I could do everything in „eco mode“ and finally was surprised how easy it was! The conditions were not as ideal as on my last tour: especially in the morning the sky was cloudy and I couldn't get full sun. As a comparison: this is only 74% of what I got in 4 days on my last tour! Day 3 is higher because I decided to stop at midday and position the solar panel directly towards the sun. I stayed there for two hours with at more or less 100W from the solar panel (so 200 Wh in 2 hours). This method is absolutely recommendable since you can get 1/3 – 1/2 of the daily production (when you are cycling normally) in just 2 hours! 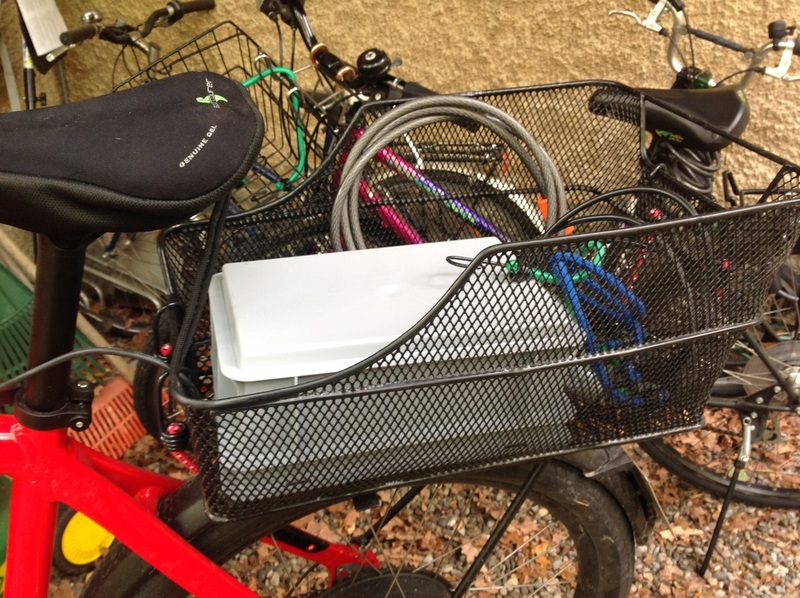 This time, I tried to got the electrical consumption even further down by pedaling without assistance on flat terrain and using the motor only for climbings or in cities (in order to be more „reactive“ in the traffic). The estimated power consumption (counting also the accumulators of the bike and the caravan that were charged to the maximum before the trip) was 2491Wh for 279 km or approximately 9 Wh / km (which in my opinion is just fantastic*:). 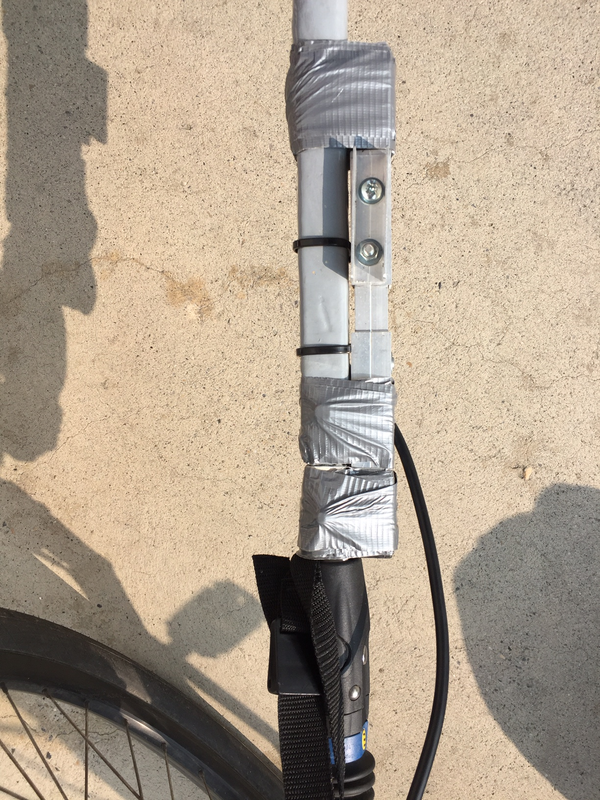 Of course, since I was pedaling quite often without any assistance, the average speed was lower than the last time: 13.9 km h.
Right: Problem fixed on the go with tape and using the leg of the foldable part as additional support. Solar power: Again, I come to the conclusion, that the solar system really does a good job! 120W doesn't look like much power, but if you use it efficiently – and are willing to pedal without assistance in the flat parts – you can easily reach 60 km per day with solar power only! If you accept to charge the Stromer at your destination (in the evening) you easily reach 100 km – which means that with the caravan you can travel the same distances as you would with a tent. Coupling system: Another (annoying) problem with the coupling system ... First it was the adapter plate on the bike, now it's the adapter for the Weber coupling. Sorry guys (or should I say: dear ingeniers): why can't you just do that right?! I mean: it's all based on offical products you sell - and in the end it doesn't work ... ! Next time I wont use any adapter parts any more! Everything that's on the coupling system should be in one piece so that you can be sure that everything is tight and that there are no moving parts! I'm not sure any more that making a caravan that short is a good idea. A longer caravan means a longer distance between the coupling point and the axle of the caravan, which results in less stress on the hitch! I think that the next caravan I build (if I have time to build one (..)) will be 2 meters long! Anyway, I'm sure I can fix that ... ! 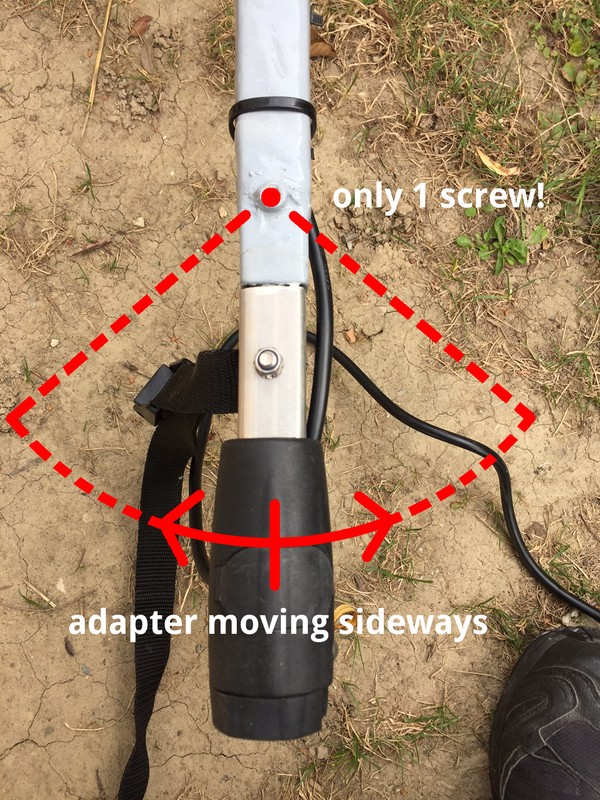 - Coupling system: Stromer (the manufacturer of my E-Bike ST1) had a look at the problem and found a solution by fixing two of the three screws from both sides and putting «lock tight» to all the screws (I must admit that I didn't do that and that's why most probably the screw got lose on my last trip ...). Would these changings be enough to secure the adapter plate? Seems to work this time (all screws tight from the beginning to the end). I still am little bit sceptical because I still think that the design of the adapter plate is not ideal and the steel plate of the Weber itselfs moves too much in my opinion. But ok: my expectations for a good coupling systems are maybe a quite high (in general, I prefer constructions that are a little bit heavier, but strong and 100% reliable). The panel has 120 Wp and I mesured a maximum of 110 W. I noticed that partial shadow makes the efficiency drop drastically: if you cover just the upper 4 solar cells (out of the 40 cells in total = 10%) you lose 50% of power! So, for optimal results it is important that the panel gets full sun, especially when the caravan is standing still. I estimate that when driving around (when the orientation of the panel is not always ideal), you get around 70-80 W in average. Of course, all other rules for solar panels apply: In the morning / evening, when the sun is very low (1-2 hours after sunrise / before sunset), you wont get much energy. - Eco-mode: The Stromer has 4 assistance modes (eco-city-tour-power). Last time I always used power-mode. This time I used eco-mode whenever possible and I only switched to higher modes during steeper climings trying no to fall below 10 km/h (most of the time using city- or tour-mode was enough). 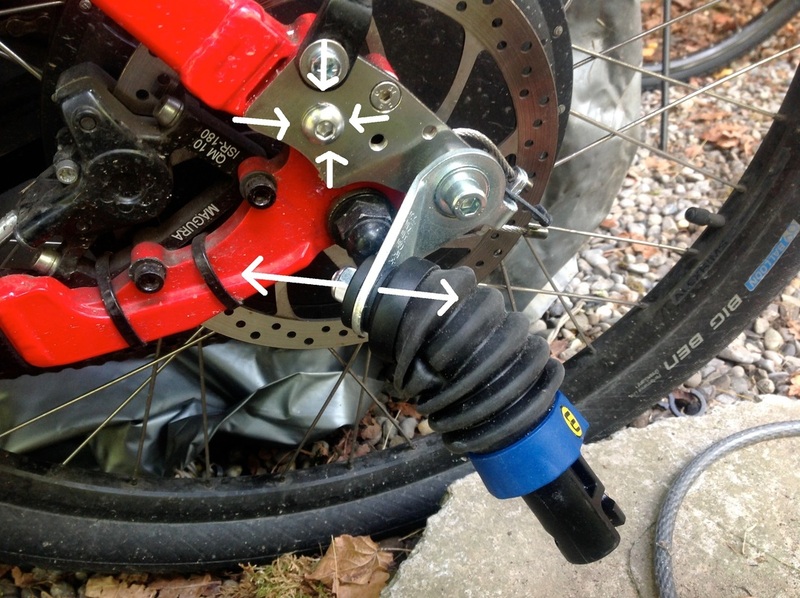 This also reduces / eliminates vibrations of the motor (that I experience especially in power-mode the last time). 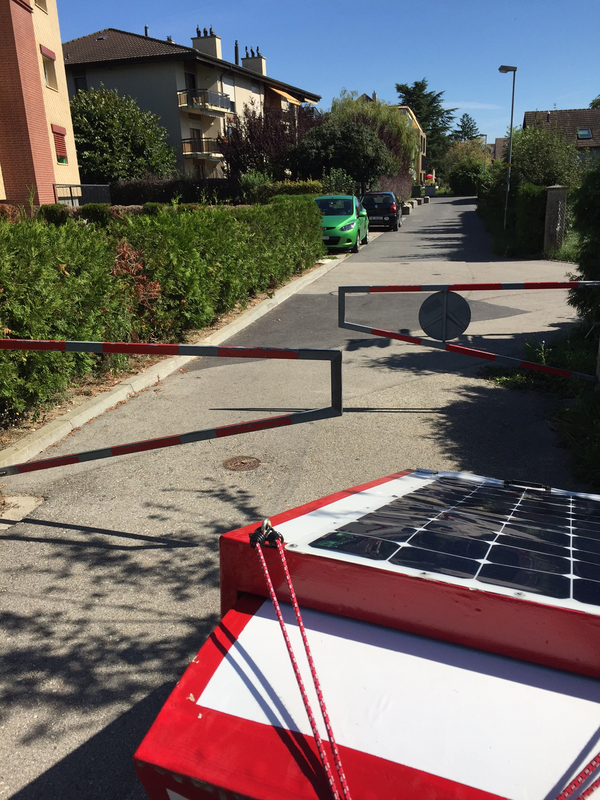 - Flat terrain: This time, there where only a few climbings, so that the power of the solar panel and the charger was enough to compensate the consumption (accu of Stromer was at 100% most of the time). Climbings instead take a lot of energy: going from Corcelles to Fribourg (16 km, 300 m climbing) took about 42% (220 Wh) of the accu. So, how many kilometers can you make with el Patu based on those values? 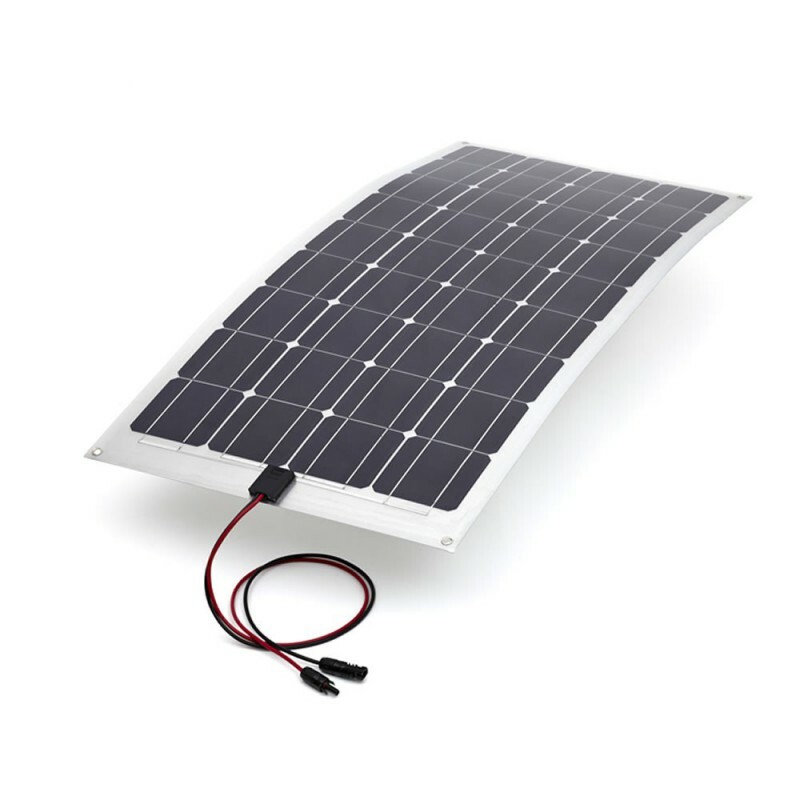 - Solar power only: you should be able to make 42-52 km / day (513–618 Wh). - Bike accu: If you start with a full bike-accu (522 Wh) and later charge it from a power supply from time to time, you can add 42 km which makes 84-94 km in total. - Caravan accu: If you also use the accu of the caravan (nominal value = 360 Wh, but with the inverter you can probably use around 300 Wh) for driving, you can again add 25 km, bringing it to a total of 109-119 km. - Another accu: Of course, there's also the possibility to take a second bike accu with you (so that distances up to 150 km / day should be in reach). No problem on the first day. In average climbings (< 10%) you generally can keep a good speed (>15 km/h). What's not nice is that the motor produces a lot of noise and vibration around 15-17 km/h. In climbings near to 10% or above you get very slow (around 10 km/h) and of course the motor doesn't work at best efficiency (this is true for all climbings > 5% I'd say). After 1 hour of cycling and 18.7 km/h, more or less after the climbing marked in the diagram, the motor went of with the message "HEAT". I waited for about 40 minutes in order to let the motor cool down. You feel EVERY (and I mean EVERY!) bump and have to drive carefully. Asphalted roads are best, but I also tried some roads with gravel (if it's small gravel and your going slow - around 10 km/h - it's ok, but really not the best choice). Both nights I slept quite well. Tree sleeping positions possible: on the back, on the side (with or without folded legs) or on the stomach. I used my winter sleeping bag with a fleece inlet and wasn't cold at all. You can go fast (easily 30 km/h in the flat), but most of the time you won't because of bumps. 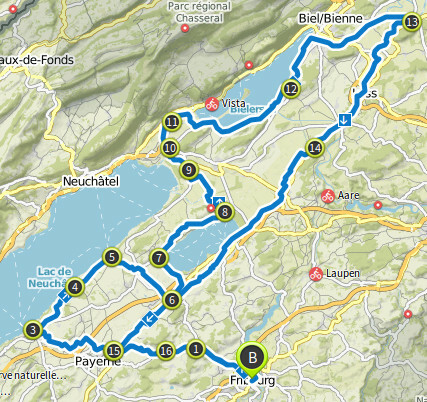 My average speed on both days was 17.3 km/h. The camping in Portalban is near the lake, so the humidity was very high. With the low temperatures during the night, everything outside got really wet. Inside the caravan, the wood really did it's job: no problems at all with humidity!!! 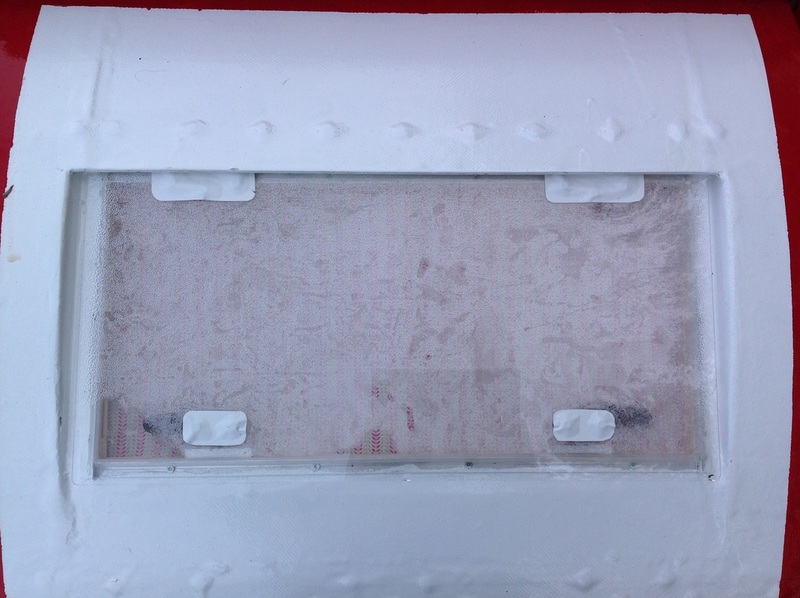 The only thing that got really wet, where the two windows (but no problem: in the morning I could dry them with a towel). In the evening, from the inside. 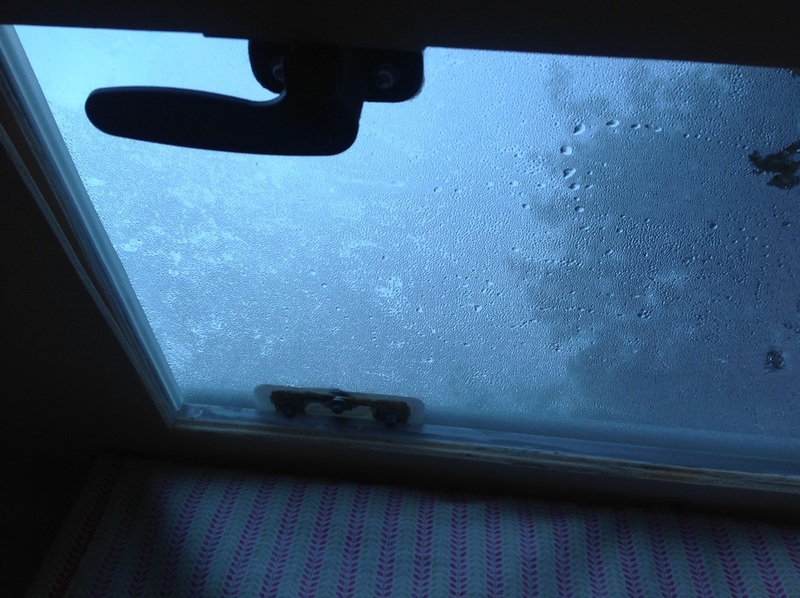 In the morning, from the inside. In the morning, from the outside. The coupling system: very, very bad!!! 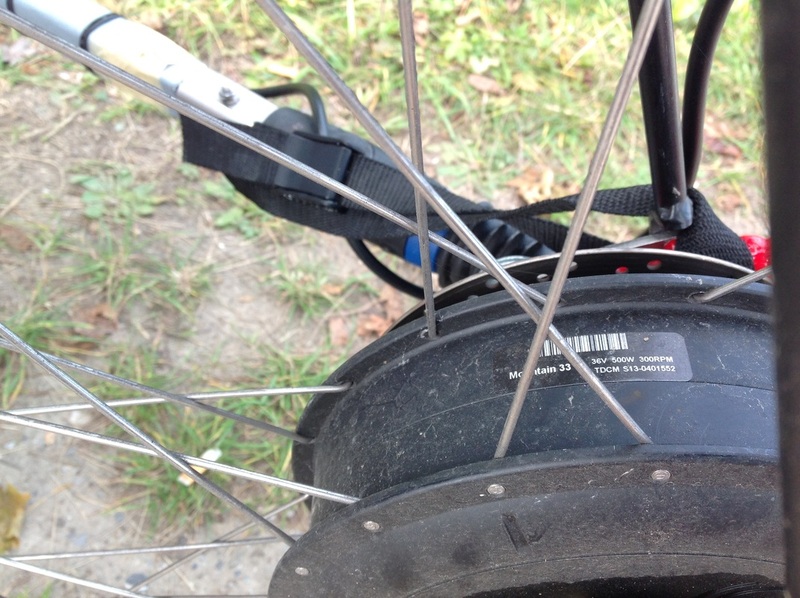 For the Weber ES, that Stromer needs a special plate which is fixed to the body of the bike with 3 screws. On both days, one of those screws got loose! Very, very bad and dangerous!!! Weber ES: I was surprised that the metal plate moves a lot! I'm not sure that this is good and I cannot imagine that this coupling system is specified for 100 kg!!! It really seems impossibly to me. I really need some time to think about that: both the plate and the Weber ES are a big deception to me!!! 28.1 - 46.8 km: Stromer accu charged from caravan accu during the ride (the Stromer accu went slowly down from 68% - 26% during the climbings since the charging was less than the consumption). 50.9 - 55.4 km: without any energy left, I had to wait 2 hours in order to get some energy from the solar pannels to make the last 4.5 km (fortunately, the sun was shining ... :-). 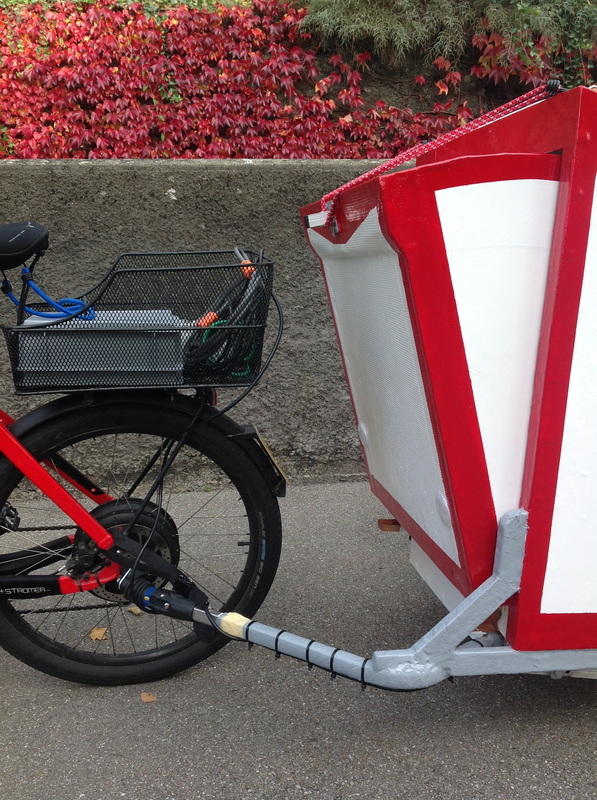 Charged the Stromer up to 31% and it was at 18% when I arrived in Fribourg. (*). 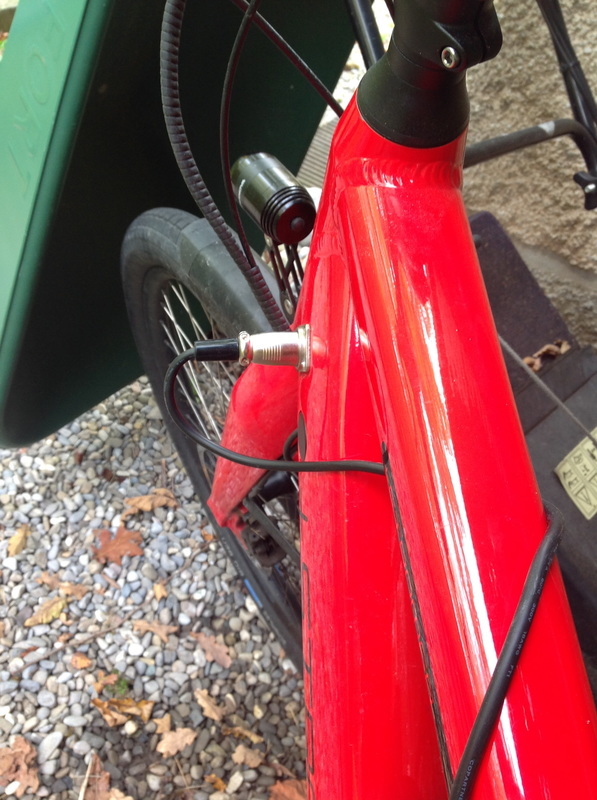 (*) The Stromer went out at 13% (first time) and at 18% (second time) which brings me to the conclusion that due to the constant charging/discharging during the ride, the percentage is not very accurate (but anyway - I got home with the last ampères at 18%:-). From the morning of the 24th to the evening of the 25th, the solar pannel accumulated a total of 265 Wh. The weather was mostly cloudy with some moments of blue sky (especially the 25th in the afternoon). In Portalban the caravan was standing in the shadow (giving a maximum of 7-8W of power). During the day, I could get 30-50W with partially clouded sky and 70-80W with blue sky. 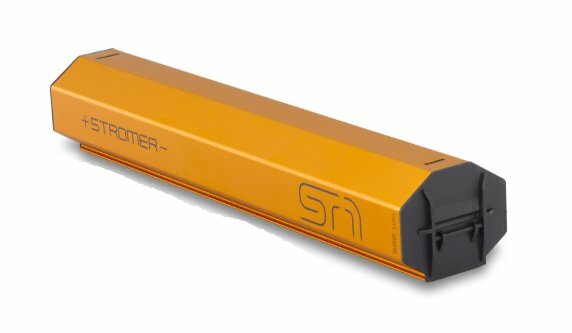 (*) Estimated, real capacity is 380Wh but the inverter shuts itself down at 10.9V which is probably 80% of the nominal capacity. (**) Only the amount charged to the Stromer battery is calculated. The caravan: It basically works! It is very heavy and therefore not appropriated for steep and long climbings because the motor of the Stromer can overheat. Normal and short climbings are ok. Ideal travelling speed is 15-20 km/h. Coupling system: It's completely useless!!! Don't have a solution for the moment, but for me it's clear that the plate and Weber EL as it is now, don't work! As I wrote above: this is a big deception. Both the Stromer and the caravan and the Stromer work well, so it's a pitty that the coupling system in the middle is the weak point! Range: The range of 28 km for the onboard accumulator of the Stromer seems poor, but since there were some climbings and the Stromer used maximum power all the time, it's the minimum you should achieve. You should get better range on flat terrain and pedaling more by yourself. Maybe it would be good to adapt the standard gears of the Stromer in order to have lower gear for climbings. Solar power: Here also, 265 Wh seem poor at first sight. But you shouldn't forget that it was cloudy, that the caravan was standing half of the second day in the shadow and that we're at the end of octobre. For me the important value are the 80W achieved today with blue sky and the octobre sun. For me that means, that in summer, the pannel will easily reach the 80W (it actually has 120Wp). Since the days in summer are longer, you should get 6-7 hours of sun without any problem. So, that means 480-560 Wh in a very pessimistic calculation, which corresponds to 26-30 additional kilometers / day. So, distances of 54-58 km (70 - 74 km with accu of the caravan, if you need it) per day with full assistance and climbings should be possible.